A new breed of the iconic cab is making its silent way onto London's roads. The new breed of the iconic black cab has begun to make its silent way onto the roads of London. 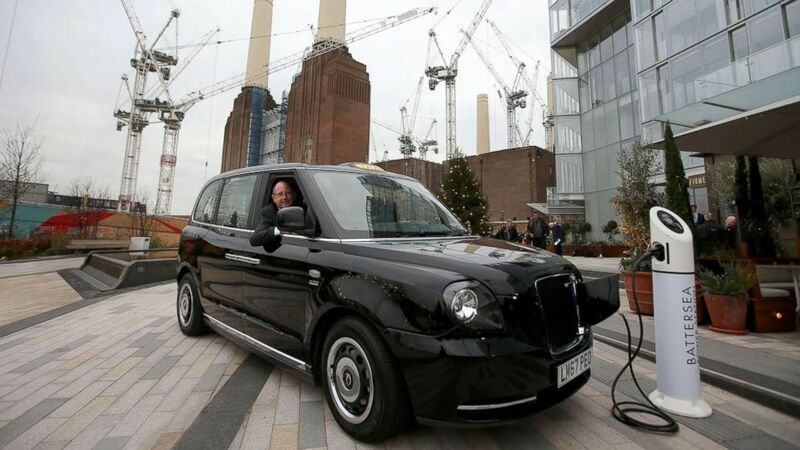 Since the beginning of this year, new rules imposed by the mayor of London, Sadiq Khan, mean that every new taxi licensed must be “zero-emission capable," and according to the transport system Transport for London, 40 electric black cabs have already been licensed. Officials hope the number will increase rapidly, with a target of 9,000 electric black cabs by 2020, and that the changes will significantly reduce pollution in London -- reducing taxis' contribution to nitrogen oxide emissions by up to 45 percent. (Daniel Leal-Olivas/AFP/Getty Images) CEO of London EV Company, Chris Gubbey poses inside the new electric TX eCity taxi connected to a sample electric vehicle charger at the Battersea power station in London, Dec. 5, 2017. This week, Khan unveiled over 100 "rapid" electric car charging points, including 51 for the exclusive use of an electric cab model called the TX eCity. The electric cab is “superior to the old one,” which runs on diesel, in every way, cabbie Peter Powell, told ABC News. When asked if he’s recommending it to other taxi drivers, Powell immediately replied, “absolutely." 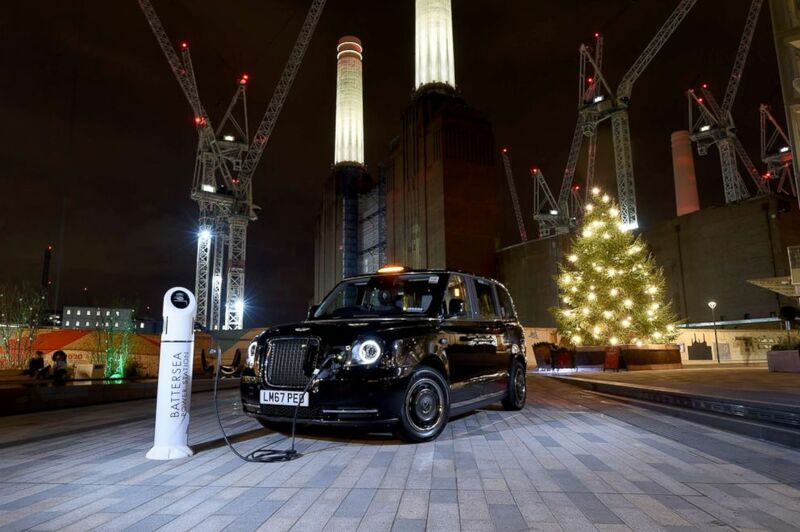 (Daniel Leal-Olivas/AFP/Getty Images) The new electric TX eCity taxi is connected to a sample electric vehicle charger at the Battersea power station in London on December 5, 2017. Similar changes are in place for London’s buses, where every new double-decker bus must be hybrid, hydrogen or electric. In addition to about 2,500 hybrid buses already in place, there are five fully electric bus routes in London, with the target being that all of central London’s single-decker buses -- about 300 -- will be electric by 2020, according to Transport for London. Over 9,000 Londoners die every year as a result of air pollution. About half of air pollution comes from road transport, which diesel cars contribute to disproportionately, according to the mayor's office. The old black cabs run on diesel. London is 15th out of 36 major world cities in terms of air quality, more comparable to Beijing and Shanghai than European capitals like Vienna and Berlin, according to the British think tank Institute for Public Policy Research (IPPR). 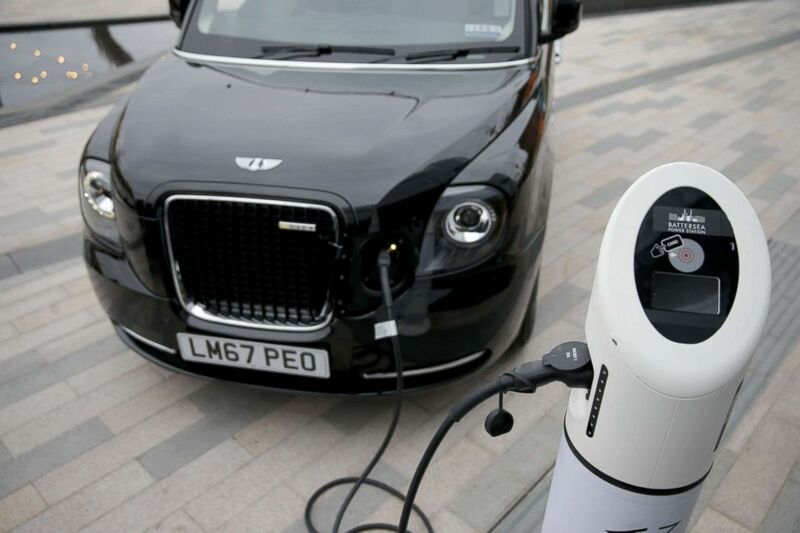 The company that makes London’s black cabs, London Electric Vehicle Company (LEVC), said they stopped making the old diesel version last summer because of the new rules. 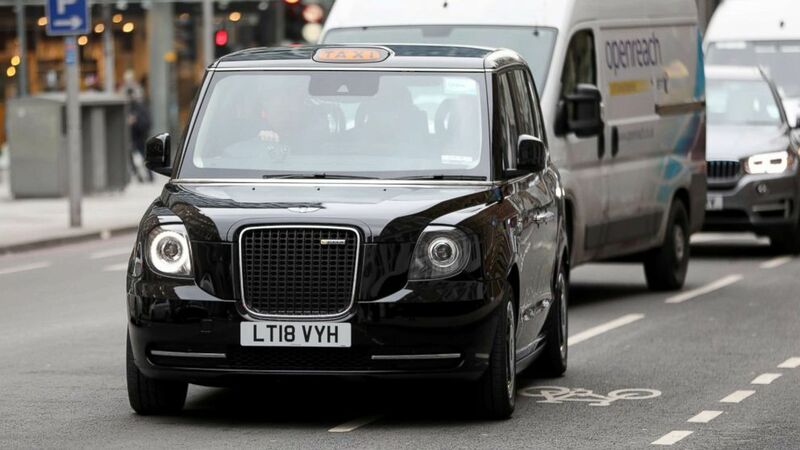 (Jed Leicester/LEVC) A new, electric model of London’s iconic black cab, the TX eCity, is seen in a photograph provided by its manufacturer, LEVC. The new taxi has a relatively small gas-powered engine in addition to the electric motor. The sole purpose of the petrol engine is to top up the electric motor if it runs low. In the pure electric mode, the taxi can go around 80 miles, with the range jumping to 377 miles with a range extender activated. That would give it an equivalent fuel economy of 217.3 miles per gallon, as opposed to the old taxi’s 33.2 miles per gallon, according to LEVC. The average cabbie drives around 120 miles a day, a lot of which is their commute to get into London, meaning they should be able to be purely electric during their working day, according to LEVC. This also saves the cabbies money. Powell reckons that the cost of charging his taxi and topping up the range extender is maybe $7, whereas fuel costs in the old cab were more like $32. It is also significantly quieter. The diesel cab is a “much noisier” experience than its electrical offspring, so both driving and getting a ride in the electric cab is a far more pleasant experience, according to Powell. The introduction of electric cabs closes an ironic circle. The first motorized cabs in London, back in 1897 were electric; they were nicknamed "Hummingbirds."